This Monitor Stand is an Effective Trade Show Display! Cheap Monitor Stand For Sale with 46" Plasma TV Bracket has a Wheeled Travel Case and Pop-Up Frame for Easy Transport! 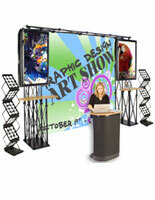 (2) TV stands add multimedia presentations to tradeshow exhibit. Television stands each hold aTV of up to 50" and less than 80 lbs. to showcase different services. Pop-up tradeshow exhibit has high-resolution 1200dpi graphics. Portable trade show counter includes inner shelves for holding beverages or additional products. 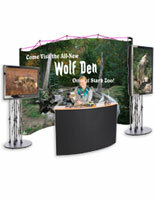 The monitor stand is a complete trade show exhibit that includes two television stands, backdrop, and portable counter. This model has blue, hook and loop receptive fabric on front and sides that allow for the display of a variety of marketing materials. The monitor stand for 46" plasma TVs can display literature trays and other graphics by simply attaching them via hook and loop strips. The easy to assemble monitor stands are convenient trade show displays. In addition to a large display counter on top, the interior of the portable counter has two (2) smaller shelves for placing marketing materials, additional merchandise, or even employee beverages! 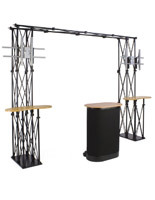 This monitor stand includes two portable truss television stands. This TV display is an excellent promotional tool that encourages interaction between customers and exhibitors. The monitor stand supports an array of television sizes with up to 50" screens that weigh no more than 80 lbs. This portable television stand also comes with a carry bag. The monitor stand's 8' wide pop-up frame allows for the printing of high-resolution graphics directly to 22mil PVC panels in 1200dpi. 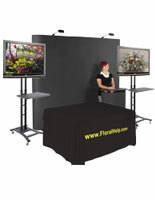 The trade show displays, monitor stands are over 7' tall and include a carrying case. 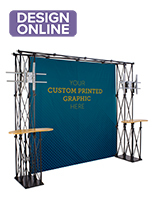 The pop-up style of the frame allows the entire display to be set-up in less than 10 minutes! This cheap monitor stand for sale with 46" plasma TV bracket is everything you need to create an effective trade show exhbiit. The VESA mount accommodates a variety of television brands. Thiis monitor stand with standardized brackets are engineered to fit most brands including Panasonic, Sony, and LG. 32.5" x 26.5" x 6.0"
99.6" x 87.9" x 35.5"
43.5" x 37.5" x 15.0"
31.5" x 74.3" x 23.8"
An in-stock lead time of 5 business day(s) begins after the artwork proof has been approved. Product does NOT ship on a same day basis.